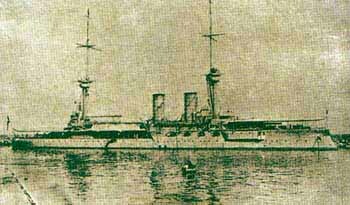 Hayreddin Barbarossa was a Brandenberg class warship that was belonging to Germany. She has been completed in 1894 in Germany. She has been sold to Turkey in September 1910. After the allie troops landed in the gulf of Suvla in 7th of august 1915, Hayreddin Barbarossa started her voyage to the area in order to help the Turkish troops under the command of Muzaffer from Mustafapasa with two other destroyers. The next day, the E-11 submarine under the command of Lt. Cdr. Nasimith VC on her second patrol in the sea of Marmara, sunked Hayreddin Barbarossa in the north side of the straits in a point close to Bulair. She sunked in 15 minutes with a loss of 250 sailors. Her position is 40º 27´ N 26º 48´ E coordinates.